veg sagu is a creamy coconut+spices based delicious curry made with mix veggies. first take all the ingredients that will be needed to make the ground paste for veg sagu. if you do not have marathi moggu (kapok buds), then skip it. add 1/4 cup water and grind to a smooth paste. keep aside. now rinse, peel and chop 1 medium to large onion, 1 small tomato and the veggies that you will be using. you will need 1.5 to 2 cups of mix veggies. you can use veggies like potatoes, carrots, french beans, cauliflower, green peas, chayote squash, capsicum. keep aside. in a thick bottomed pan, heat 2 tablespoons oil. lower the flame and add 1 teaspoon mustard seeds and let them crackle. as soon as they begin to crackle, add 1 teaspoon urad dal. fry the urad dal lentils till they become golden. then add 8 to 10 curry leaves, a pinch of hing, 1 to 2 dry red chillies. saute for a few seconds or till the red chilies change color. saute the onions on a low to medium flame, till they turn translucent. then add a pinch of turmeric powder. mix well. now add the chopped mix vegetables and tomatoes. mix the vegetables with the rest of the tempering mixture. now add 1.25 cups water. cover the pan with its lid and cook the veggies on a low to medium flame. do check a couple of times when the veggies are cooking. when the vegetables are almost cooked, add the ground masala paste. rinse the sides of the grinder jar with 1/2 to 2/3 cup water and add this to the pan. if you have scraped the entire ground paste from the jar, then just add 1/2 to 2/3 cup water directly in the pan. cover the pan with its lid and simmer till the gravy thickens a bit and you see oil specks on top. this will take about 7 to 8 minutes on a low flame. 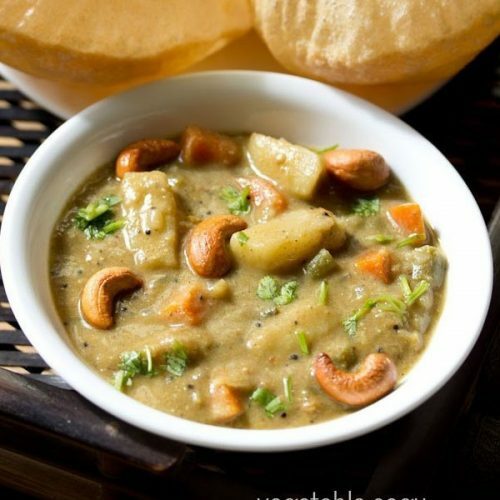 serve veg sagu hot with pooris, chapatis, paratha or set dosa, poha dosa or neer dosa. while serving garnish with chopped coriander leaves and some fried cashews. for frying cashews, just take 10 to 12 cashews and fry them in 1 to 2 teaspoons of oil. here i have deep fried the cashews as i had made pooris and in the same oil, i fried the cashews.